Quick news and information can be found on our new Museum Newsletter. Upcoming events, special campaigns and so much more. You are in for a real treat. We are going to do three things: 1) Honor Leo Fong, 2) Have a special birthday celebration for both Leo Fong and Bruce Lee (yes, you will enjoy cake), PLUS a Q&A SESSION from Leo Fong and special guest with a complete insight on the fight between Bruce Lee and Wong Jack Man. This will be a very historic session and it is something you don’t want to miss. Cost is only $10. Film maker Robert Rodriguez El Rey Network has a wonderful show called Lucha Underground. Coming this Dec. 3, you will meet them in person. With a Red Carpet event, a special screening and Q&A of the starts. THIS IS A FREE OPEN HOUSE EVENT! Our tour requests have doubled this year so we are having growing pains. We are in desperate need of a larger location. Please join our IMPACT OUR FUTURE campaign with a one-time donation of $50 to $100 to help us grow. We realize that for many, traveling to the Museum would be very difficult or impossible. So, we are bringing the Museum to you. With a special ONLINE TOUR, you will enjoy the world's first and only Martial Arts History Museum. Cost is the same as going to the Museum itself, just $10. You will enjoy a hour of fun as you go through the museum led by Museum president Michael Matsuda. We are planning to release the tour in January. Yes, it's that time again for those last minute year-end deductions. 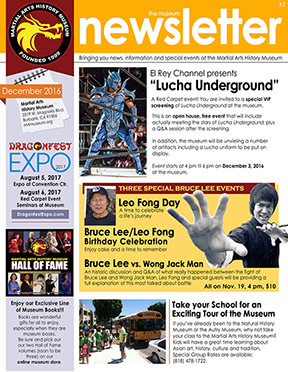 The Martial Arts History Museum is a Non-Profit 501(c)(3) charity organization. 100 percent of what you donate to the Museum is tax-deductible. So, please consider making a generous donation to the Museum so that you can deduct it from your taxes.